This time last year we wrote a piece on Livewire calling a short-term top for resources, targeting a correction of around 10% before we became buyers once again, which you can see here. As it turned out, resources did retreat by a little over 10% affording us an attractive buying opportunity in the sector. Since that time we’ve been active within our resource exposures enjoying a very strong strike rate over the period as outlined below, with only one of our resources holdings (Newcrest) generating a negative return. Livewire asked us to talk about where we are hunting today, and given the cycle has moved to a stage where we are now seeing M&A, we take a look at 5 potential takeover targets. 2018 is likely to see an increase in M&A activity with the resources sector likely to lead the charge – the likes of BHP and RIO have become huge cash-generating goliaths. Around 70% of the sector already enjoy net cash on their balance sheets while continuing to generate further free cash flow i.e. lots of cash for corporate activity for many miners both locally and overseas. We’ve already seen M&A in the mineral sands space, with Eramet's bid for Mineral Deposits at an impressive 26% premium to the previous day’s closing price. No doubt a number of companies are sharpening their pencils as I type. Here we look at 5 potential takeover targets, earmarking them as ideal opportunities moving forward. Importantly, when considering a takeover target, we also need to have faith in the underlying business, and the below examples fit this bill nicely. Copper business OZL would be an ideal target for a northern hemisphere producer. 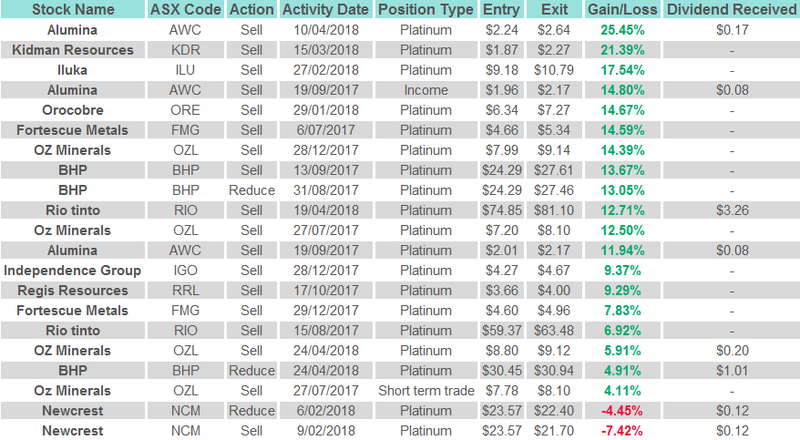 We took profit on our OZL holding last week but the volatile stock has held up pretty well so far as underlying commodities slip – a frustrating outcome to-date. 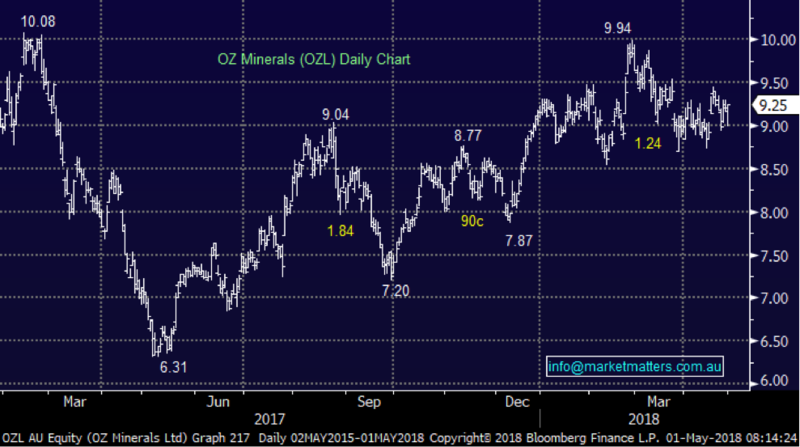 We are a buyer of OZL into weakness with an ideal buy level below $8.50. IGO may interest people in the nickel space to get access to its Nova nickel operation plus a pretty good gold asset to sell on (Tropicana). 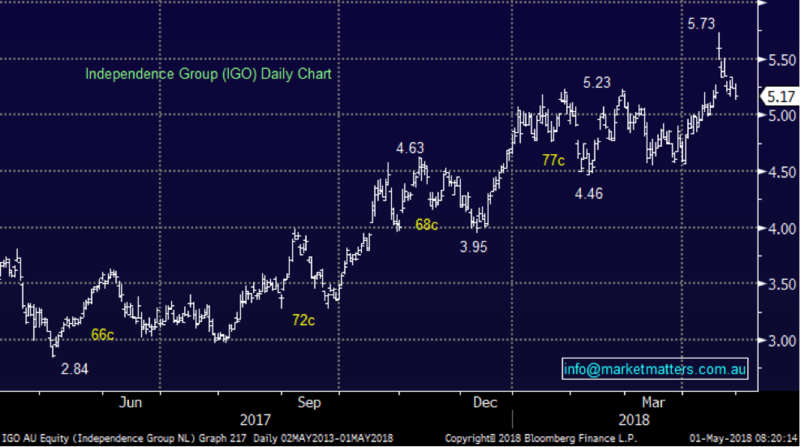 IGO is a volatile stock that has already corrected ~70c four times since mid-2016. This morning they released Q3 production numbers that looked incredibly weak, setting up a big Q4 if they have any hope of meeting prior full year guidance. This may be an opportunity today depending prices this morning. We are a buyer of IGO into weakness below $5 leaving enough ammunition to average around $4.60. ORE sits right in the centre of the “hot” battery / lithium space, one we have been focusing on very profitability over recent quarters. The highly speculative nature / price action of the sector has allowed us to both buy and sell in regions we perceive to be value or too euphoric respectively. 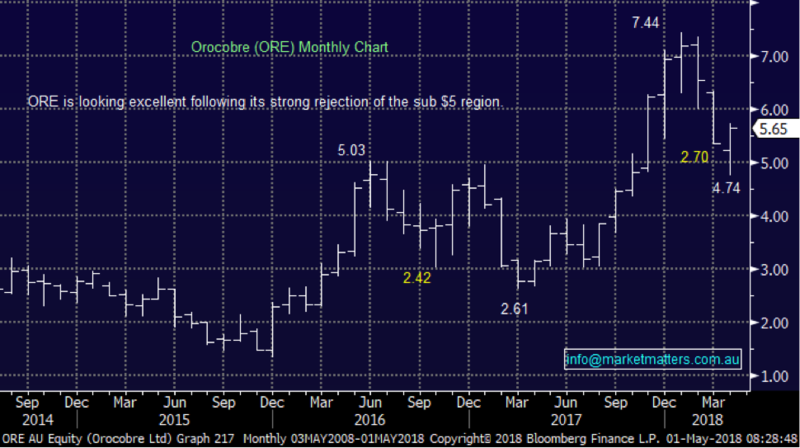 Toyota has already taken a significant stake in ORE almost $2 higher at a 35% premium to yesterdays close, we ask why they would not consider adding to this holding to lock in future supply for decades to come. We remain bullish and comfortably long ORE. Mineral exploration company SYR has been an “ugly duckling” of the sector over recent years failing to rally like most of its piers. The company’s projects provide exposure to graphite, vanadium, mineral sands, copper, coal and uranium. The coated spherical graphite is a high value, processed graphite product which is used to produce battery anode material (BAM) for anodes in lithium (Li) ion batteries – the battery story again. We like SYR as a speculative play around current levels. We recently took a nice profit on AWC but unfortunately missed the final spike up towards $3 – the stock is now basically back to where we took profit. 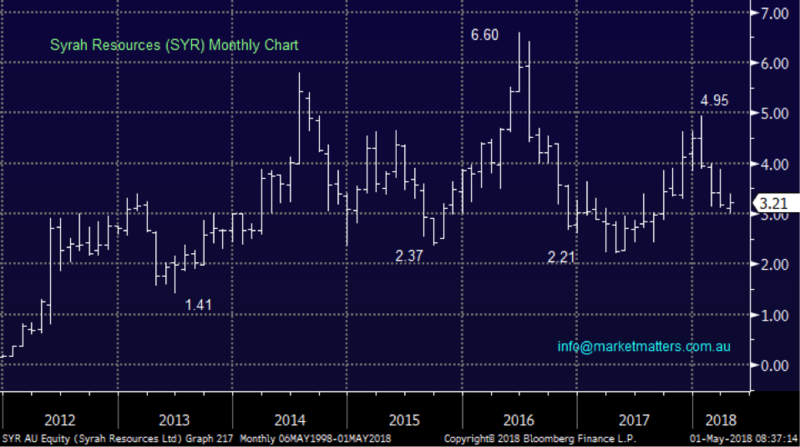 We like the stock moving forward and especially the yield of 6.5% fully franked so the question is where do we try and buy back in – let’s hope we haven’t been too clever! With a new shareholder agreement with Alcoa signed (last year) the door is now open for either Alcoa or a major global alumina punter i.e. 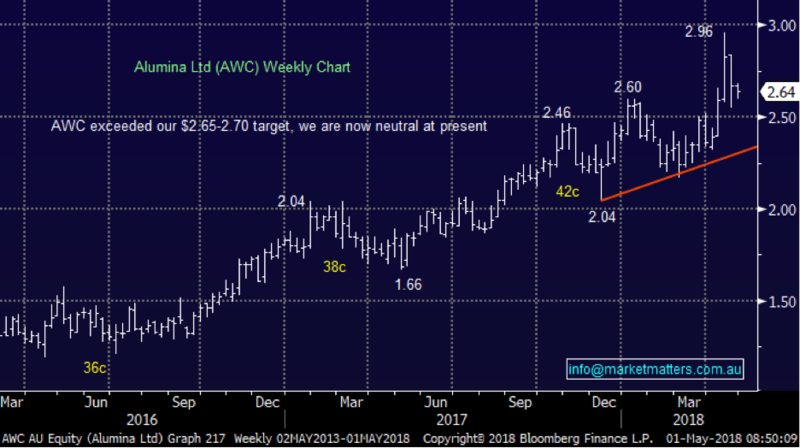 China Inc. MM likes AWC and is ideally looking to buy weakness back towards $2.35. Want to hear if we pull the trigger?